Rest in peace. Blessings go out to your family. Thank you for your sacrifice, we will honor and remember you. My thoughts and Prayers to your Family and Friends. Thank you for your service. God Bless you all. RIP Agent Scott McGuire, and may God bless your wife and son for the rest of their lives. Thank you for your sacrifice sir. On behalf of my family, I extend our sincerest condolences on the grievous loss you suffered when Scott was killed. To the McGuire family, fellow agents, and all who call Scott beloved, my heart goes out to all of you and may you find comfort in your loved ones and your strength in your faith. When my son was killed, the entire law enforcement community in our area embraced us in a circle of love and support, and I know you will receive the same support. It makes the unbearable less torturous, and I pray for your solace. This reflection is sent with the utmost respect for the dedicated service Scott gave to his community and the citizens of our country, and for the supreme sacrifice he and his family made on January 24, 2016. "In Valor there is Hope" Tacitus. Thank you for your service, we will not forget. I pray that time and the support of your brothers and sisters in Blue help your family find peace. Our LEO family extends to each of you our sincerest condolences. To all family, friends, and fellow co-workers of Special Agent Scott McGuire, our thoughts and prayers go out to you. May comfort and support be found from those around you and from Our Lord and Savior above. My family would like to extend our sincere condolences to the family, friends, and fellow co-workers of Special Agent Scott McGuire during this very difficult time. You're in our thoughts and prayers. May they find comfort and support from those around them. May God help heal their aching hearts. 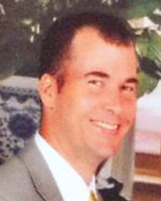 Rest in peace, Special Agent Scott McGuire. Rest in Peace my brother officer. We'll take the watch from here. Rest in peace. May your family be watched over for they are loved. Rest with God Agent McGuire. Prayers for your personal and departmental families during this time in their lives. You are in a better place. Prayers to your family and remember youll see them again on the other side. God Bless and Godspeed, Agent McGuire.